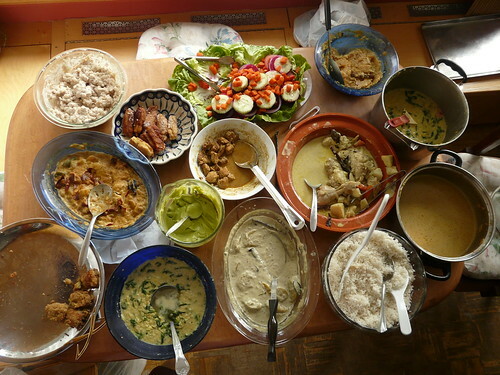 I’m planning a dinner party for this Friday – I know I’m making Indian food, but not how many people I’m serving. If I have the time, my usual strategy is to make enough food for everyone who could possibly come, then extra in case they invite friends. This is not always the smartest strategy. That’s after 14 or 15 people ate and most of them had seconds of something. That’s also with two days to shop and a whole Saturday spent cooking. So not a weeknight dinner party. But regardless of scale or time, the basic principles still apply- whatever I make I want it to be filling and colorful and delicious. Of course with the time constraints and unknown factors, I’m going to try to do things that are easy to prepare and not too expensive. Recipes I’ve tried before and/or have all the ingredients on hand get first choice. Creativity comes after all that. I don’t know a lot about traditional Indian menus, but I do know that I’ll have some kind of rice, dhal (lentils) and raita (yogurt salad), along with whatever other vegetable and meat curries I decide on. I will need to keep in mind that I’ll probably have vegetarians (not difficult) and the spice-averse (sometimes difficult) on the guest list. On a practical/nutritional standpoint I’ll go back to what my Mom taught me. Growing up, I didn’t need a food pyramid to know that a well balanced meal should include starches, fruits and vegetables, protein/meat, dairy, and only a small amount of sugars and salts. That’s just the way my mom cooked, and it’s still how I prepare menus. Plus, relying on filling staples like rice, beans, and potatoes and de-emphasizing meat dishes is always more economical. With so many vegetarians in India, it’s not at all difficult to round out the meal with a lot of different textures and colors. The only remaining criterion to keep in mind are preparation time and how spicy the dishes are. The yogurt raita and rice both help with spicy food, and the dhal can if I don’t decide to make it spicy. raita – fruit? cucumber? spinach? Fortunately dessert isn’t a big deal, but I’ll see if something appeals to me. Drinks are the same, I may try to make some sort of lassi yogurt drinks or chai tea, but if it takes too long to do the other dishes I won’t worry about serving something simpler. And drinks are usually easiest for people to bring anyway.